One of the worst environmental disasters of the decade is currently underway in a quiet community 25 miles northwest of Los Angeles. Putrid, methane-rich natural gas has been spewing into the air at an estimated rate of nearly 1,300 metric tons per day for over two months. Experts are calling it the climate version of the BP oil spill, and the leak isn’t going to be contained anytime soon. Natural gas is often touted as a cleaner energy source than oil or coal, because of the lower greenhouse gas emissions associated with burning it. But as this disaster highlights, there are insidious risk to natural gas production. Coupled with weak regulation, they can make this energy source as dirty as the fossil fuels it’s meant to replace. “The science is crystal clear: if you allow the methane to leak, you can wipe out its climate benefits,” Tim O’Connor, director of the Environmental Defense Fund’s Oil and Gas Program in California told Gizmodo. In fact, everything about the leak is eerily reminiscent of the oil spills that have blackened oceans and beaches for over a century. These parallels underscore a hard truth: we need to transition off carbon-based fuels entirely to fix our planet. 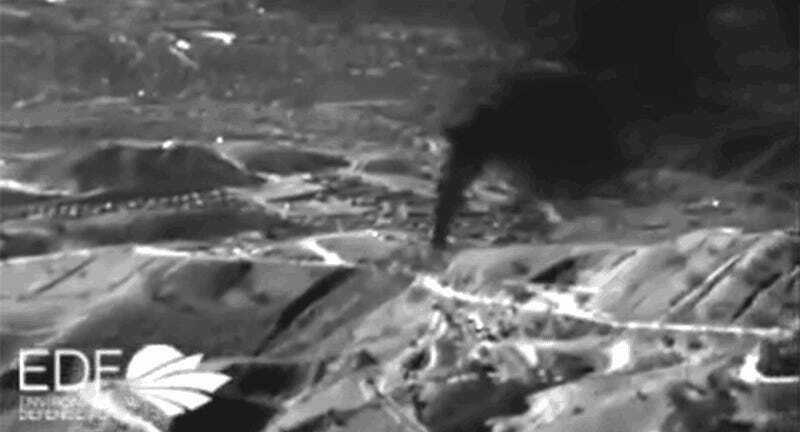 On October 23rd, a natural gas leak erupted at a storage well beneath the community of Porter Ranch. The well stores gas carried by pipelines from extraction operations hundreds of miles away in Texas, the Midwest, and the Rocky Mountains. The leak has taken a serious toll on Porter Ranch residents, who for weeks have reported headaches, nausea, dizziness, and other symptoms. Methane is odorless and non-toxic, but natural gas producers inject it with trace quantities of sulfurous chemicals called mercaptans so that leaks can be detected by scent. According to Cyrus Rangan, director of the Toxics Epidemiology Program at LA County’s Department of Public Health, the stench from the leak is so foul that residents are having a physiologic response to it. “People are having very real responses, based on their own sensitivity,” Rangan told Gizmodo. “In terms of acute chemical exposures, this is a really, really big deal.” Rangan estimates that somewhere between four and five thousand families have filed for help, with 2,200 families temporarily relocated so far. As of this week, the leak has sent over 73,000 metric tons of methane gas skyward, according to estimates published by the Environmental Defense Fund, which is providing real-time updates on the situation. And that’s a big problem for our climate. Although short-lived in the atmosphere, methane is a potent greenhouse gas, with up to 80 times the global warming potential of CO2 in the first twenty years of its lifespan. 73,000 metric tons of methane is the global warming equivalent of over six million metric tons of CO2. Put another way, the daily emissions from Porter Ranch are essentially equivalent to sticking seven million additional cars on the road. At last check-in, the drilling operation had reached a depth of 3,850 feet, and—in an important milestone—workers have now identified the seven-inch wide leaky gas pipe using magnetic ranging technology. Still, SoCalGas warns that plugging the leak and stopping the flow of methane could take until the end of March. But whatever mitigation measures SoCalGas takes, the leak highlights the shortcomings of natural gas—and how it’s regulated. Nobody’s sure exactly how the Porter Ranch leak started, but a report by the EDF paints a disturbing picture of the state of natural gas pipes around Los Angeles. Nearly 40 percent of the pipes in SoCalGas’ jurisdiction are over 50 years old, and they’re leaking everywhere. 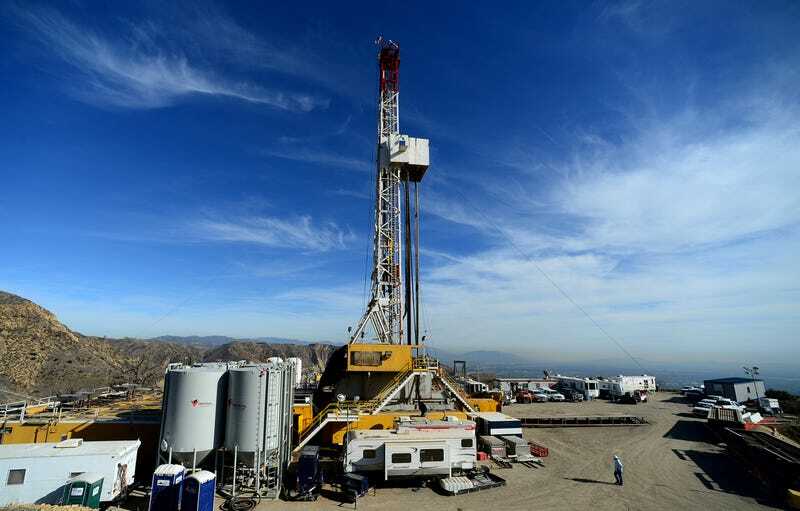 The EDF reports an average of one methane leak every four to five miles across Pasadena, Inglewood, and Chino, three geographically disparate neighborhoods. These leaks vary from less than 1,000 to over 60,000 liters of natural gas per day. That means tens of thousands more cars worth of carbon emissions thanks to crappy infrastructure. Nationwide, O’Connor estimates there are approximately 400 underground methane storage areas subject to little to no federal regulation—other Porter Ranch disasters waiting to happen. “These facilities are exempt from federal requirements for underground injections, and they fly under the radar until catastrophes strike,” he said. And that’s not to mention leaks during drilling, transportation through pipelines, and distribution. If we’re going to see a net climate benefit from natural gas production over fossil fuels, experts say no more than 3 percent of gas can leak during the entire production process. In some parts of the country, we’re well beyond that figure. In other areas, the amount of leakage simply isn’t known. For the first time this year, the EPA has introduced national standards that would directly regulate methane emissions from oil and gas facilities built in the future. But as the EDF points out, these rules say nothing about facilities already in operation. If the natural gas industry wants to sell an environmentally-friendly alternative to oil, all of its infrastructure needs to be air-tight.